Learn about our Returns and Exchanges Policy for all purchased products and services. Please select one of the options below for details. Our Returns and Exchanges Policy for all purchases made in our physical stores. NOTE: This policy applies only to items purchased in-store. Always make sure to retain your receipt. For our orders placed through our Web site, please refer to our Online Returns and Exchanges Policy. Most items may be returned or exchanged within 10 working days of original purchase. The time period for returns for clothing purchases may be extended upon request in the pre-Christmas period from December 1 until January 15. At the start of the fall and winter semesters in September and January the ten working day return limit is extended for textbooks until five (5) working days after deadlines for class changes and drops. Proof of the dropped course from the Registrar is required. Note, the day after you drop your course online, you can print an unofficial transcript from Minerva- a "W" (withdrawal) will be shown on your transcript, for dropped courses. Course Materials (textbooks and coursepack) purchased during exam periods are final sale. Exact dates will be posted in the store and on the Bookstore website. Customers are responsible for checking the condition of their books at the time of purchase. We are not responsible for the condition of the book once it has left the store. 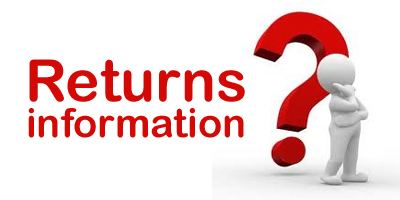 All returns are at the discretion of store personnel. Merchandise must be in perfect condition. Returns are accepted based on the standards set by the publishers. Publishers will not accept any books with even just the slightest defect or damage. This means no refunds or exchanges if book is fully or partially read, used, marked, bent, torn or if the spine is cracked. It must be perfect! It is beyond the Bookstore's control if the publishers’ policies affect your return. If one of these policies affects your return and is beyond the Bookstore’s control, the Bookstore will be happy to provide you with the publisher's phone number. Merchandise must be in original packaging. No refunds or exchanges if shrink wrap is removed. Garments must be unworn and in mint condition with all original hang-tags attached. Must present Student ID or McGill ID or other suitable ID, eg, driver’s licence. With the exception of sale merchandise, which is non-returnable, all defective merchandise will be replaced. If the Bookstore does not have stock of an item, and cannot replace the item within a reasonable amount of time, a full refund will be issued. Course Packs are non-refundable even if the course is dropped. A Course Pack may be exchanged if store personnel are satisfied that the Course Pack was incorrectly purchased for the wrong course and proof of enrollment is provided. There are no exceptions to this policy. Shrink-wrapped books or books containing tapes or software are non-returnable if opened (this policy has been set by the publishers not the Bookstore). Sale or discounted items, or any items marked "final sale"
Our Returns and Exchanges Policy for all purchases made through the Le James - McGill Bookstore Web site. NOTE: This Returns and Exchanges policy applies only to items purchased from our Le James - McGill Bookstore Online Store. For all purchases made at our physical stores, please refer to our In-Store Returns and Exchanges Policy. No returns or exchanges will be processed without prior authorization. While the Le James / McGill University Bookstore tries to ensure that every shipment sent to our customers (you) is correct there may be occasions when the product does not perform as expected. In these cases the Le James - McGill Bookstore will refund the full cost of the original item including shipping, to the credit card used to originally pay for the order. In order to return or exchange items you must first contact us within 14 calendar days of receiving the original order. In order to do this, and to ensure that your email is not accidentally rejected by our systems as spam, please complete our Returns Form. We will then contact you by email with full instructions relating to the return and a prepaid shipping label to be printed and placed on the package. If the goods that you ordered from the Le James - McGill Bookstore Online Store arrived damaged or were not what you ordered, the Le James - McGill Bookstore will refund the original purchase price and will pay for the shipping to return the goods to the store. If you wish to exchange for the originally ordered items we will ship them to you at no additional charge. Refunds to your credit card will take place only when we receive the goods at our store and all shipping charges are non-refundable. If you decide, upon receiving the goods, that you do not wish to keep them the Le James - McGill Bookstore will refund the original purchase price less the cost of return shipping provided that the goods are returned in saleable condition. If you wish to exchange the items the Le James - McGill Bookstore will provide the exchanged items and charge the difference in price and the additional shipping charges. Any refunds to your credit card will take place only when we receive the goods at our store and all shipping charges are non-refundable. Any orders that have chosen the shipping option of "In-Store Pickup" must be picked up at the pickup location indicated on your order within 30 days of purchase. Failure to pick up an order within 30 days will result in the order being refunded to the credit card used for the original purchase, minus a 10% processing fee (except non-refundable items...see below). Course Packs not picked up within 30 days will be destroyed (copyright requirement) with no refund issued. All items purchased "On Sale" are not eligible for refund or exchange under any circumstance. The Le James - McGill Bookstore reserves the right to change this policy without notice at any time. In case of a change to this policy between the time that an order is made and the return, the policy in effect at the time the order was placed will apply.